Claire, welcome back to Homeschooled Authors. What have you been up to since you have last been here? Howdy! Thanks for having me back! I’ve since been busy with grad school (I’m currently in my third semester of physical therapy school), and have been frantically trying to keep up with getting my second book published! As a busy college student, when do you find the time to write? Short answer: I don’t! During the semester I really don’t have time for anything other than studying. During break is when I get most of my writing done. I make a ton of notes on my phone and my planner is full of sticky notes for when I actually get a chance to write. This semester I’m trying to change things up a little and take some time on weekends to write a little, not only for stress relief but to prevent my younger siblings from stalking me to see if I’ve written any more in a current WIP I’m sharing with them. How does it feel to have the second book in your series out? It feels pretty fantastic! I still can’t believe the publisher accepted the first book, let alone think the second could be successful! What is the most encouraging thing anyone has said about your book? There’s a young girl I’ve connected with on an online writer’s forum we both frequent and she read The Rise of Aredor after I recommended it. She later told me that it’s one of her favorite books and she’s since read it 6 times in 2 months. I just thought “Wow! That’s a lot!” And then to be listed among the top writers that have influenced her? It was insane to see my name up there with Tolkien. I feel like that’s a lot to live up to. Ha ha! What can people expect from The Wildcat of Braeton? It’s the story of two men trying to find their place at home after returning from wars and foreign countries. They both want nothing more than peace but there are more battles to be fought. Corin and Aiden are trying to find their place in their world and help their families understand who they’ve become. There is action, adventure, humor, some dashes of romance, and always the theme of family. Was this book harder or easier to write then The Rise of Aredor? I’d say a little bit of both. I know the characters even better than I did in The Rise of Aredor so it was fun to see them continue to grow and develop. But two different characters have storylines in this book and the scale of the story goes up a few notches, so that was more difficult to keep up with and to try and do justice to their story. Who will enjoy this sequel? Anyone who likes strong male and female characters and healthy doses of action, a lot of humor, a little bit of romance, and a little bit of tragedy. 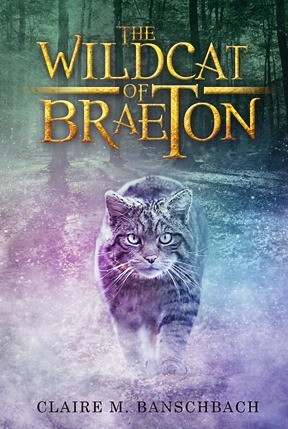 The Wildcat of Braeton releases on May 19, 2015. Enter to win a copy below. Very interesting! I'll have to put this book on my mental wishlist. My jaw hit the ground when she told me that! I hope she likes this one as much as the first! Is this open to international winners? :S I live in NZ, so I won't click 'Enter' until I know. I love the book's cover art. Especially the font used for the words "The Wildcat of Braeton". I really like how the cover artist has put the "of" and the "T" in the underline of "Wildcat". The cover of your new book is amazing! Thank you! :) I really love it!